Epilepsy is characterized by recurrent seizures and is the third most common neurological disorder in the world, with 0.5 - 1% of the population suffering from the disease. (1) In 20 - 40% of these patients, medications alone are unable to adequately control seizures and are therefore diagnosed with drug-resistant epilepsy. (1) For 60% of patients with drug-resistant epilepsy, surgery can significantly reduce or eliminate seizures. (2, 3) Despite such treatments, 15 - 40% of all patients with epilepsy unfortunately continue to have seizures that impair their daily living. (4) In an effort to improve the quality of life for these remaining patients, both epileptologists and neurosurgeons have been turning to the use of neuromodulation – the application of electric currents to the nervous system. Unlike VNS and DBS, which administer continuous stimulation, a closed-loop neuromodulation system only delivers stimulation when it detects the beginnings of seizure activity. In that way, it functions much like a pacemaker does to stop abnormal heart rhythms. Such stimulation works to either reduce the risk of having a seizure altogether or stops seizures from spreading to other parts of the brain. Patients who are evaluated for traditional epilepsy surgery often need to undergo an initial surgical procedure to determine exactly where the seizures start. To do this, patients are monitored for seizures during a hospital stay. Brainwaves are monitored using an electroencephalogram (EEG), which involves placing electrodes on the brain surface, with wires exiting out through the skull and scalp. Once a seizure occurs, doctors can use the EEG to pinpoint the area of the brain that is causing seizures and define the target for surgery. The first closed-loop stimulation system to be implanted is the responsive neurostimulator system (RNS) by NeuroPace, Inc. (Mountain View, CA). (31) It consists of a main component, about the size of a pocket watch (measuring 4 x 6 x 0.7cm) connected to two electrodes. (21) The main component contains a battery and a computer that can analyze EEG readings and administer stimulation once it detects a seizure onset. This device can also store small snippets of EEG data, which can be downloaded to a NeuroPace computer, which in turn, can transfer the data securely to a central server where the patient’s neurologist can see the data. Caption: Illustration of a closed-loop, responsive neurostimulation system. 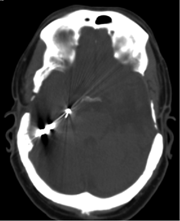 Caption: CT scan of a closed-loop, responsive neurostimulation system. At this time, long-term experience beyond five years is currently very limited and the side effects of intermittent, long-term (also termed “chronic”) stimulation remain unclear. 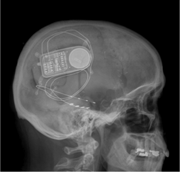 Caption: X-ray of a closed-loop, responsive neurostimulation system. A great deal of research remains to be done in closed-loop stimulation for the treatment of epilepsy. Both parts of the closed-loop – seizure detection and stimulation for halting seizures – must not only be individually optimized, but also work in unison with each other. Current algorithms analyze the EEG signal itself to detect changes that may represent seizure activity. While these systems are very sensitive to abnormalities in the EEG, they will often flag events that are not truly seizures. Therefore, extensive research is being done on signal processing that will help detect reliable changes in EEG signals that may not be otherwise be visible to the naked eye. Stimulation parameters to halt seizure activity must also be improved. Currently, these parameters are based mainly on experience with DBS and with stimulation performed as part of an evaluation for surgical removal of a seizure focus. As long as the patient continues to download data from the device onto the provided computer, the NeuroPace system has the ability to store EEG data over months and years. This type of long-term monitoring has already proven to be invaluable in our understanding of epilepsy. One study showed that on average it could take over a month before the complete spectrum of a patient’s seizure activity was seen. (45) Another study demonstrated differences in the time of day that seizures from different parts of the brain occur. (48) A third study has also highlighted the negative effects of caffeine intake on EEG activity. (49) Overall, chronic monitoring with this device provides data in a naturalistic setting, which may be used to help epilepsy treatment teams with treatment decisions. The examples above are only a sample of the possibilities that exist for closed-loop neurostimulator systems. In all aspects of neuromodulation, continued collaboration between engineers and doctors will help to advance the field – and ultimately provide higher levels of care for patients. 1. Choi H, Sell RL, Lenert L, et al. Epilepsy surgery for pharmacoresistant temporal lobe epilepsy: a decision analysis. JAMA : the journal of the American Medical Association. 2008;300(21):2497-505. Accessed October 3, 2012. 2. COOKE PM, SNIDER RS. Some cerebellar influences on electrically-induced cerebral seizures. Epilepsia. 1955;4:19-28. Accessed October 3, 2012. 3. Sharan AD, Rezai AR. Neurostimulation for Epilepsy. In: Krames ES, Peckham HP, Rezai AR, eds. Neuromodulation. London: Elsevier; 2009:617-66. 4. Vonck K, Boon P, Achten E, De Reuck J, Caemaert J. Long-term amygdalohippocampal stimulation for refractory temporal lobe epilepsy. Annals of neurology. 2002;52(5):556-65. Accessed October 3, 2012. 5. Health C for D and R. Recently-Approved Devices - VNS Therapy System - P970003s050. Accessed October 3, 2012. 6. Good LB, Sabesan S, Marsh ST, et al. Control of synchronization of brain dynamics leads to control of epileptic seizures in rodents. International journal of neural systems. 2009;19(3):173-96. Accessed October 3, 2012. 7. Kossoff EH, Ritzl EK, Politsky JM, et al. Effect of an external responsive neurostimulator on seizures and electrographic discharges during subdural electrode monitoring. Epilepsia. 2004;45(12):1560-7. Accessed October 3, 2012. 8. Lesser RP, Kim SH, Beyderman L, et al. Brief bursts of pulse stimulation terminate after discharges caused by cortical stimulation. Neurology. 1999;53(9):2073-81. Accessed October 4, 2012. 9. Al-Otaibi FA, Hamani C, Lozano AM. Neuromodulation in epilepsy. Neurosurgery. 2011;69(4):957-79; discussion 979. Accessed October 4, 2012. 10. Davis R, Emmonds SE. Cerebellar stimulation for seizure control: 17-year study. Stereotactic and functional neurosurgery. 1992;58(1-4):200-8. Accessed October 4, 2012. 12. Mormann F, Elger CE, Lehnertz K. Seizure anticipation: from algorithms to clinical practice. Current opinion in neurology. 2006;19(2):187-93. Accessed October 3, 2012. 13. Esteller R, Echauz J, Tcheng T, Litt B, Pless B. Line length: an efficient feature for seizure onset detection. In: 2001 Conference Proceedings of the 23rd Annual International Conference of the IEEE Engineering in Medicine and Biology Society.Vol 2. IEEE; 2001:1707-1710. Accessed October 3, 2012. 14. D’Alessandro M, Esteller R, Vachtsevanos G, et al. Epileptic seizure prediction using hybrid feature selection over multiple intracranial EEG electrode contacts: a report of four patients. IEEE transactions on bio-medical engineering. 2003;50(5):603-15. Accessed October 3, 2012. 15. Litt B, Esteller R, Echauz J, et al. Epileptic seizures may begin hours in advance of clinical onset: a report of five patients. Neuron. 2001;30(1):51-64. Accessed October 3, 2012. 16. Echauz J, Padovani DA, Esteller R, Litt B, Vachtsevanos G. Median-based filtering methods for EEG seizure detection. In: Proceedings of the First Joint BMES/EMBS Conference. 1999 IEEE Engineering in Medicine and Biology 21st Annual Conference and the 1999 Annual Fall Meeting of the Biomedical Engineering Society (Cat. No.99CH37015).Vol 1. IEEE; 1999:439. Accessed October 3, 2012. 17. Gotman J. Automatic seizure detection: improvements and evaluation. Electroencephalography and clinical neurophysiology. 1990;76(4):317-24. Available at: http://www.ncbi.nlm.nih.gov/pubmed/1699724. Accessed October 3, 2012. 18. Viglione SS, Walsh GO. Proceedings: Epileptic seizure prediction. Electroencephalography and clinical neurophysiology. 1975;39(4):435-6. Accessed October 4, 2012. 19. Osorio I, Frei MG, Wilkinson SB. Real-time automated detection and quantitative analysis of seizures and short-term prediction of clinical onset. Epilepsia. 1998;39(6):615-27. Accessed October 4, 2012. 20. Osorio I, Frei MG, Sunderam S, et al. Automated seizure abatement in humans using electrical stimulation. Annals of neurology. 2005;57(2):258-68. Accessed October 4, 2012. 21. Anderson WS, Kossoff EH, Bergey GK, Jallo GI. 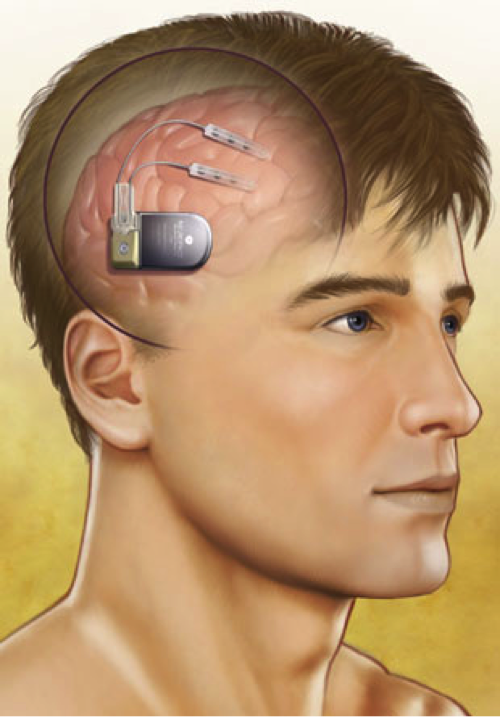 Implantation of a responsive neurostimulator device in patients with refractory epilepsy. Neurosurgical focus. 2008;25(3):E12. Accessed October 3, 2012. 22. Gigante PR, Goodman RR. Alternative surgical approaches in epilepsy. Current neurology and neuroscience reports. 2011;11(4):404-8. Accessed October 3, 2012. 23. Morrell MJ. Responsive cortical stimulation for the treatment of medically intractable partial epilepsy. Neurology. 2011;77(13):1295-304. 24. Anon. Pivotal Trial Data Demonstrate NeuroPace RNS® System Reduced Seizures in People with Epilepsy. NeuroPace: News. 25. Sun FT, Morrell MJ, Wharen RE. Responsive cortical stimulation for the treatment of epilepsy. Neurotherapeutics : the journal of the American Society for Experimental NeuroTherapeutics. 2008;5(1):68-74. Accessed October 3, 2012. 26. Morrell M. Brain stimulation for epilepsy: can scheduled or responsive neurostimulation stop seizures? Current opinion in neurology. 2006;19(2):164-8. Accessed October 3, 2012. 27. Springer US, Bowers D, Goodman WK, et al. Long-term habituation of the smile response with deep brain stimulation. Neurocase. 2006;12(3):191-6. Accessed October 4, 2012. 28. Jobst BC. Electrical stimulation in epilepsy: vagus nerve and brain stimulation. Current treatment options in neurology. 2010;12(5):443-53. Accessed October 4, 2012. 29. Smith JR, Fountas KN, Murro AM, et al. Closed-loop stimulation in the control of focal epilepsy of insular origin. Stereotactic and functional neurosurgery. 2010;88(5):281-7. Accessed October 4, 2012. 30. Zhong X-L, Yu J-T, Zhang Q, Wang N-D, Tan L. Deep brain stimulation for epilepsy in clinical practice and in animal models. Brain research bulletin. 2011;85(3-4):81-8. Accessed October 4, 2012. 31. Anon. FDA Grants Premarket Approval (PMA) for the NeuroPace® RNS® System to treat Medically Refractory Epilepsy. NeuroPace: News. Accessed Nov. 15, 2013. 32. Andrews RJ. Neuromodulation: advances in the next five years. Annals of the New York Academy of Sciences. 2010;1199:204-11. Accessed October 4, 2012. 33. Hariz MI. Complications of deep brain stimulation surgery. Movement disorders : official journal of the Movement Disorder Society. 2002;17 Suppl 3:S162-6. Accessed October 3, 2012. 34. Joint C, Nandi D, Parkin S, Gregory R, Aziz T. Hardware-related problems of deep brain stimulation. Movement disorders : official journal of the Movement Disorder Society. 2002;17 Suppl 3:S175-80. Accessed October 3, 2012. 35. Beric A, Kelly P, Rezai A, et al. Complications of deep brain stimulation surgery. Stereotactic and functional neurosurgery. 2001;77(1-4):73-8. 36. Oh MY, Abosch A, Kim SH, Lang AE, Lozano AM. Long-term hardware-related complications of deep brain stimulation. Neurosurgery. 2002;50(6):1268-74; discussion 1274-6. Accessed October 4, 2012. 37. Koller WC, Lyons KE, Wilkinson SB, Troster AI, Pahwa R. Long-term safety and efficacy of unilateral deep brain stimulation of the thalamus in essential tremor. Movement disorders : official journal of the Movement Disorder Society. 2001;16(3):464-8. Accessed October 4, 2012. 38. Motamedi GK, Lesser RP, Miglioretti DL, et al. Optimizing parameters for terminating cortical afterdischarges with pulse stimulation. Epilepsia. 2002;43(8):836-46. 39. Lehnertz K, Litt B. The First International Collaborative Workshop on Seizure Prediction: summary and data description. Clinical neurophysiology : official journal of the International Federation of Clinical Neurophysiology. 2005;116(3):493-505. Accessed October 3, 2012. 40. Shah RS, Chang S-Y, Min H-K, et al. Deep brain stimulation: technology at the cutting edge. Journal of clinical neurology (Seoul, Korea). 2010;6(4):167-82. Accessed October 4, 2012. 41. Weaver FM, Follett K, Stern M, et al. Bilateral deep brain stimulation vs best medical therapy for patients with advanced Parkinson disease: a randomized controlled trial. JAMA. 2009;301(1):63-73. 42. Zesiewicz TA, Sullivan KL, Arnulf I, Chaudhuri KR, Morgan JC, Gronseth GS, et al. Practice Parameter: treatment of nonmotor symptoms of Parkinson disease: report of the Quality Standards Subcommittee of the American Academy of Neurology. Neurology. 2010 Mar 16;74(11):924-31. 43. Geller EB, Skarpaas TL, Gross RE, Goodman RR, Barkley GL, Bazil CW, Berg MJ, Bergey GK, Cash SS, Cole AJ, Duckrow RB, Edwards JC, Eisenschenk S, Fessler J, Fountain NB, Goldman AM, Gwinn RP, Heck C, Herekar A, Hirsch LJ, Jobst BC, King-Stephens D, Labar DR, Leiphart JW, Marsh WR, Meador KJ, Mizrahi EM, Murro AM, Nair DR, Noe KH, Park YD, Rutecki PA, Salanova V, Sheth RD, Shields DC, Skidmore C, Smith MC, Spencer DC, Srinivasan S, Tatum W, Van Ness PC, Vossler DG, Wharen RE Jr, Worrell GA, Yoshor D, Zimmerman RS, Cicora K, Sun FT, Morrell MJ. Brain-responsive neurostimulation in patients with medically intractable mesial temporal lobe epilepsy. Epilepsia. 2017 Jun;58(6):994-1004. 44. Meador KJ, Kapur R, Loring DW, Kanner AM, Morrell MJ; RNS® System Pivotal Trial Investigators. Quality of life and mood in patients with medically intractable epilepsy treated with targeted responsive neurostimulation. Epilepsy Behav. 2015 Apr;45:242-7. 45. King-Stephens D, Mirro E, Weber PB, Laxer KD, Van Ness PC, Salanova V, Spencer DC, Heck CN, Goldman A, Jobst B, Shields DC, Bergey GK, Eisenschenk S, Worrell GA, Rossi MA, Gross RE, Cole AJ, Sperling MR, Nair DR, Gwinn RP, Park YD, Rutecki PA, Fountain NB, Wharen RE, Hirsch LJ, Miller IO, Barkley GL, Edwards JC, Geller EB, Berg MJ, Sadler TL, Sun FT, Morrell MJ. Lateralization of mesial temporal lobe epilepsy with chronic ambulatory electrocorticography. Epilepsia. 2015 Jun;56(6):959-67. 46. Loring DW, Kapur R, Meador KJ, Morrell MJ. Differential neuropsychological outcomes following targeted responsive neurostimulation for partial-onset epilepsy. Epilepsia. 2015 Nov;56(11):1836-44. 47. Spencer D. Responsive Neurostimulation and Cognition. Epilepsy Curr. 2016 Mar-Apr;16(2):98-100. 48. Spencer DC, Sun FT, Brown SN, Jobst BC, Fountain NB, Wong VS, Mirro EA, Quigg M. Circadian and ultradian patterns of epileptiform discharges differ by seizure-onset location during long-term ambulatory intracranial monitoring. Epilepsia. 2016 Sep;57(9):1495-502. 49. Mackow MJ, Krishnan B, Bingaman WE, Najm IM, Alexopoulos AV, Nair DR.Increased caffeine intake leads to worsening of electrocorticographic epileptiform discharges as recorded with a responsive neurostimulation device. Clin Neurophysiol. 2016 Jun;127(6):2341-2.